White City Shabbat & Nefesh B'Nefesh hold holiday combination event for lone soldiers and olim. 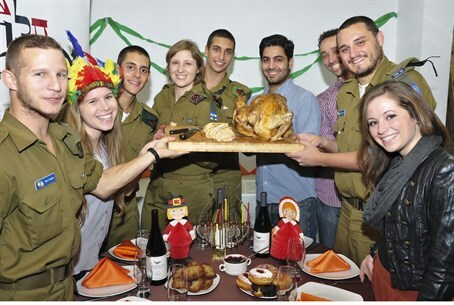 On Thursday 50 lone soldiers (immigrant soldiers in Israel without their family) and over 200 young Olim (immigrants) celebrated a "Thanksgivukkah" event combining Thanksgiving and Hanukkah festivities. Hanukkah and Thanksgiving occur on the same date only once in thousands of years, and the term "Thanksgivukkah" was coined for the occasion - and also to express the fact that both holidays commemorate the fight for religious freedom. Many Orthodox Jews in the USA celebrate Thanksgiving, a holiday without Christian connections, in order to express their gratitude to the only land that afforded them freedom before the State of Israel was established. The event in Israel, held at Tel Aviv's Goren Synagogue, was organized by Nefesh B'Nefesh (NBN), a group aiding immigration to Israel by Jews from North America and the UK, along with White City Shabbat which hosts Jewish events in Tel Aviv. Tel Aviv's deputy mayor Asaf Zamir led the Hanukkah menorah (candellabra) lighting ceremony. In addition to a three course meal featuring traditional foods such as levivot/latkes (potato pancakes) and turkey, the event featured a clothing drive to promote kindness to those who are less fortunate. Benji Davis, Events & Programs Coordinator at Nefesh B'Nefesh, said "this was a great opportunity for young professionals and lone soldiers to enjoy a traditional festive meal and express their thanks together with fellow Olim from around the country." Deborah Danan, co-director of White City Shabbat and native of England, said she didn't feel Thanksgivukkah had to be an exclusive holiday combination for American Jews.